This consolidated contact directory pulls together religious institutions and their contact information into one organized directory, containing all the information you need to connect. Find church email lists, phone numbers, addresses, names, and titles of religious personnel of multiple denominations at once. Religious organizations of many faiths can be found easily with this one email database. Bookyourdata.com offers businesses the tools they need to start better B2B marketing campaigns and make connections with their specific audiences. This religious institution and church email list is full of the targeted contacts you're looking for. 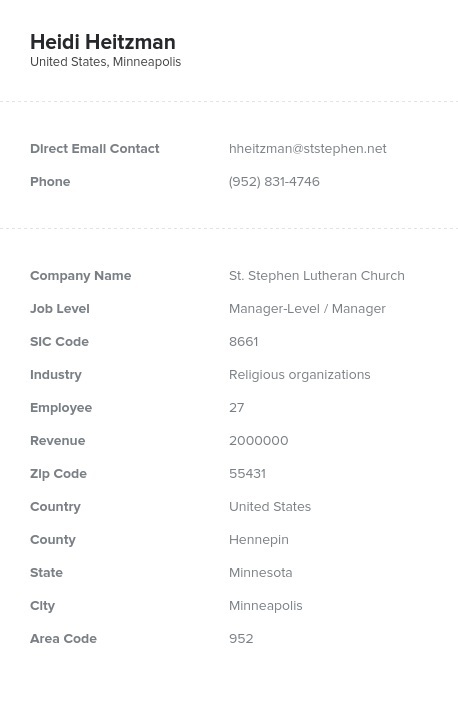 After downloading this human-verified directory, you'll be able to find the religious institutions that are in need of your products or services. Temples, mosques, synagogues, churches, and other religious institutions support their local communities by providing services and helping groups in need. They require many resources to keep going: volunteers, organization, planning, and logistical solutions. They may also need your company's products or services, whether that's an event-scheduling software program, a set of missals or hymnals, or maintenance for their facilities. Reach out using this religious mailing list to let this group know about how your company can help them take care of their members and parishioners. Connect with congregations today using this extensive data product from Bookyourdata.com. Find the information you need, download this affordable religious group email database, start connecting within a few clicks, and email leads that will be most interested in the products and services provided by your business. This directory of premium religion and worship-related sales leads can be integrated into your CRM and used right away. There are no extra, hidden fees. Help these religious, nonprofit groups serve their communities by letting them know about your company with this accurate data list. Buy it and enlighten a new group of potential advocates today!